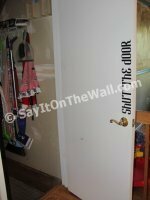 This post is sponsored by Say It On The Wall. Say It on the Wall is an online shop specializing is just about any sort of vinyl decor you could possibly want! I really enjoyed exploring the site and looking at all the fun products...and ways to use them! Laura, the lovely owner of Say It on the Wall sent me my very own vinyl saying to try out. so I chose this definition! No sooner had I placed my order than I turned around and it was already on my doorstep. Okay, not really. But it did come super fast. And it's sooooo cute. The shop has so many fun sayings etc. that I had a very difficult time narrowing it down to just a few to show you. We need this "shut the door" sign at my house! It's too bad the Hubby is not a fisherman, because I think this one is funny! 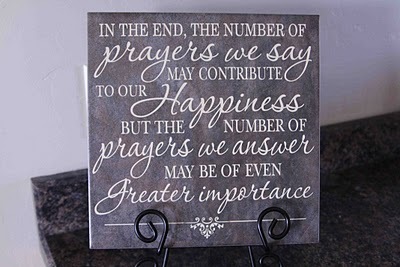 I love the idea of putting phrases on tile...so cute. Check out this vinyl clock face. What a great idea for a DIY clock. Today, Laura has generously offered to give one reader of The Shabby Nest a $30 gift certificate to use at the Say It on the Wall shop!!! Not only that, but for any orders placed throughout the duration of this giveaway Laura has generously offered a 40% discount on YOUR ENTIRE ORDER. That's right...40% off. But hurry, the discount is only open until the giveaway ends. And that will be Friday, March 18th at 11:59 MST. Just use the code SHABBY40 at checkout. For your chance to win become a fan of Say It on the Wall on Facebook. For additional entries follow the Say It on the Wall blog. Remember, you must leave me one comment for each entry for it to be counted. This post was sponsored by Say It On The Wall. The opinions expressed are 100% mine. I have liked say it on the way on facebook. I also follow the say it on the wall blog. Thanks for a chance to win. Liked Say It on the Wall on facebook! I am now following Say It on the Wall's blog!! My computer froze just as I reached 'I chose this definition'. The suspense was agony! I liked on Facebook. Might just need to place an order before Friday! How wonderful is that, LOVE LOVE LOVE! How cute is this site! I just became a follower of you and Say It on the Wall! Um...yes please! I'd love to try out the vinyl on the wall that is all the rage these days! I follow your blog! I "liked" Say It On A Wall" on fb. I am a follower of Say It On A Wall's blog. Yeah! We all love giveaways. Love "Say It On the Wall" Great ideas. OK. Just "liked" Say it on a Wall on FB. Yeah! I am excited about this giveaway! I like Say it on the Wall on Facebook! I liked it on Facebook! Love the Create definition! How cute!!!! I have liked it on facebook and I must admit I really do like it! I am now following their blog and I can see a purchase in the very near future! I just went thru my Facbook and "unliked" everything, deleted all apps, and set my page to private, because a dear friend had her Facebook hacked into and it's caused so many problems....so I can just enter once here? I like Say it on the Wall on FB. I follow the Say it on the Wall Blog. I "liked" Say It On The Wall on FB. Thanks for the great giveaway! I became an fan on Facebook. Hi!! I became a fan on fb!! also, followed there blog!! :) I'm so excited!!! liked say it on the wall! following! and definitely need to place an order before friday! good stuff!